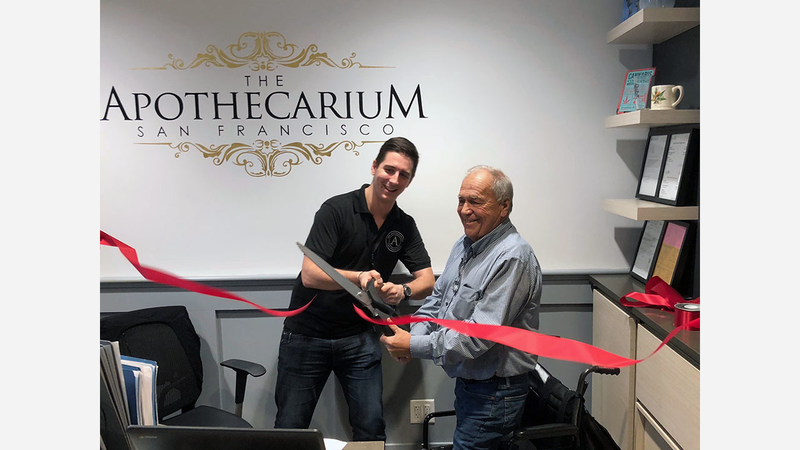 Today, The Apothecarium dispensary at 2414 Lombard St. (and Scott) opened its doors to recreational users. Just before 11am, staff gathered with cannabis patient Dieter Schien for a ribbon-cutting ceremony before store manager Michael Caruso opened the doors, declaring "all right, let's sell some marijuana." Schien, an amputee who uses a wheelchair, said the location is convenient for him, as it's ADA accessible and he can arrive by bus from his home in Marin County, where recreational cannabis isn't available. Display containers allow customers to smell samples before buying. "We expect to see much bigger crowds than before," said Eliot Dobris, head of marketing and communications at The Apothecarium, adding that it might take a few days before the news reaches everyone. A few minutes before opening time, only one patient stood in line outside. He declined to share his name and said he came across this morning's ribbon-cutting by accident, even though he was planning to stop in. "There is less traffic at that time of the day," he said, laughing. As the closest dispensary to Golden Gate Bridge, Dobris said the store is expecting a high volume of customers from Marin. As an enticement, The Apothecarium is offering them 20 percent off purchases made today through Sunday; an ID or utility bill is required for proof of residency. In the anticipation of bigger crowds, "we've been adding staff to our three locations in San Francisco," Dobris said. New products must now be pre-packaged. When Hoodline asked people who work nearby for their reaction to recreational cannabis sales in the Marina, responses ranged from neutral to positive. "I'm not old enough to buy it, but I think it's pretty cool," said Romeo Ramos, an employee of neighboring business Kara's Cupcakes at 3249 Scott St.
A manager we spoke to at wedding shop Sarah Seven (3208 Scott St.) said she was completely unaware that The Apothecarium was now selling to non-medical patients, but didn't express concern. After delays, the Board of Supervisors approved regulations for recreational sale in November 2017, including a 600-foot buffer zone between stores and schools. Late Mayor Ed Lee gave the green light for the new legal framework at the beginning of December. But dispensaries still need a city permit before they can apply for a state license, which meant local delays made it impossible to start sales on January 1st. Last Friday, the first of those licenses were finally issued, allowing six shops to start selling recreational marijuana. Among these shops was The Apothecarium's Castro location, where customers lined up after they opened Saturday morning. Eliot Dobris, The Apothecarium's head of marketing and communications. According to state documents, The Green Cross (4218 Mission St.), Medithrive (1933 Mission St.), ReLeaf Herbal Cooperative (1284 Mission St.), Harvest on Geary (4811 Geary Blvd. ), Grass Roots (1077 Post St.) also received licenses. On Janurary 8th, Shambhala Healing Center (2441 Mission St.) followed, while The Apothecarium's Marina location was added to the list Wednesday, together with its SoMa dispensary at 527 Howard St., which will start selling recreational marijuana tomorrow at 10am. In 2016, voters approved Proposition 64, which made it legal to grow and possess limited amounts of recreational marijuana, but the regulation only kicked in statewide this year. As Hoodline content partner ABC7 reports, the new freedom comes with limits. Only people 21 or older allowed to carry up to 28.5 grams of marijuana or eight grams of concentrates, and it's still illegal to consume it in public or in a vehicle.